Man, what the hell. Escape Velocity hasn’t made a peep in forever. Are they EVER going to open? Man, are we EVER going to open? What the hell? We’ve been quiet for a while since our crowdfunding effort. The main reason is we don’t really have any updates as of yet. The final stage in our journey to opening is waiting for our loan to process so we can purchase the Parkside building and get the doors open. It’s a long, slow process when you are starting a company alone, not rich, with only a few minor investors. It takes forever. ForEVER! Except instead of Homer waiting to shoot stuff, it’s us waiting to sign stuff. Specifically loan paperwork that will let us get our damn doors open already. So the update is: we’re also waiting, but there is an end in sight. We should have our loan, and subsequently, the building in September. Once we get the building, we need to dig through all the Parkside seafood stuff to find out what we need and what we don’t need (Don’t need, 12 oyster shuckers, bin full of oyster shells, Parkside Seafood shirts, etc). Then we are doing some minor work to the building itself to make the front entrance and bathrooms ADA compliant, a little redecorating to switch from sea-faring ship to spaceship, then we will open our doors as a craft beer bar and vegetarian/vegan restaurant. Ideally we are open in that capacity by Thanksgiving. During that time, construction of the brewing facility will start with us serving our own beer sometime in the beginning of 2019. In more exciting news, despite not yet having a full scale brewery to brew in, our brewer, Jason (It’s me. 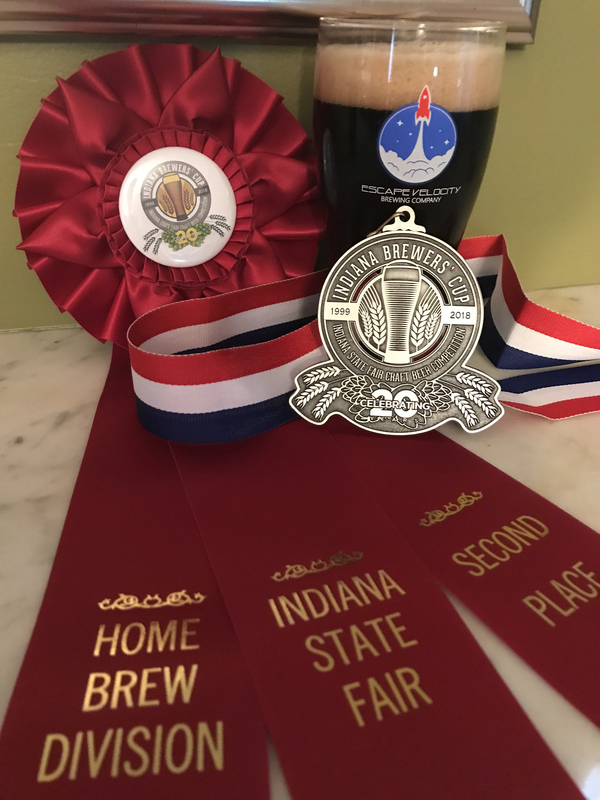 I’m writing this post), continued brewing and entering competitions as a home brewer in preparation for the brewery opening, and our stout, Magnificent Desolation, took home the silver medal in the Indiana State Fair Brewer’s Cup for stouts! This is the 4th award for the stout which includes Best of Show in the 2016 Indiana State Fair Brewer’s Cup and Silver Medal for stouts in the mid-west region of the National Homebrew Competition. Stay tuned here and on our social media. We will have tangible updates soon if it kills us. Once we have a for sure timeline, we will have a regular opening/construction update post at least once a week. Oh buddy, we can’t wait to have those posts for you. It’s happening. Soon. May 9, 2018 By admin in News Comments Off on We’re so close! Exciting news and a call for help! We’ve finally found the perfect home for Escape Velocity Brewing! We’ve successfully rezoned part of the property so we can build on a brewing facility, however for legal reasons, we had to start a new LLC to purchase the property, and so can’t use the other funds we have raised (don’t worry, they will be essential for construction and equipment costs). So are now asking one more time for your help in raising funds for the purchase of this building and land. Please considering donating to our Indiegogo campaign, and forwarding to your friends! We have new fun perks, and are SO CLOSE to realizing our dream of bringing delicious beer and vegetarian food to our community! The cat’s out of the bag – we’re hoping to move into the former Parkside Seafood! We are currently under contract for this building, contingent on our ability to get approval to build a brewing facility onto the current structure. We are excited and hopeful that this will all go through! We live in this area, and are very excited at the prospect of being our own neighborhood pub! We love our community, and hope to serve delicious beer and vegetarian/vegan food to friends old and new in our neighborhood! March 30, 2017 By admin in News Comments Off on We’re in Nuvo! Check out this article about Jason brewing with Broadripple brewpub and information about the brewery! March 17, 2017 By admin in News Comments Off on We’re in the Journal & Courier! We’re in the Journal & Courier! We’re excited for the coverage. Check it out!